not Batman. It was The Phantom. Writer Lee Falk drew on tales of Zorro and The Scarlet Pimpernel in creating his mysterious hero, but shortly after the strip's Feb. 17, 1936 beginning, he added a wrinkle of his own. 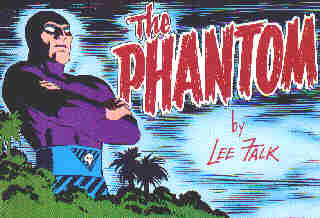 Originally, Falk planned for readers to discover that The Phantom was actually a member of the first story's supporting cast. But before he made that revelation, he had a better idea — the idea that made the strip a classic, enjoyed by readers all around the world, for over six decades. He decided to make the character immortal. Falk accomplished this by making the present-day Phantom the 21st in a line stretching back over 400 years. During all that time, his ancestors had fought evil wearing the same costume, in the same unspecified jungle venue, encouraging a legend that they were, in fact, the same man. Later accoutrements that were added — including the Jungle Patrol, which he secretly heads; the Bandari, a tribe he rules; the Phantom Chronicles, from which adventures of his ancestors are occasionally recounted; and especially the "old jungle sayings" that lend credence to his legendary status — all serve to add to the character's appeal. The strip played a minor but notable role in World War II. When the Germans occupied Norway, they tried to demoralize the people by forcing newspapers to print stories about America having been utterly destroyed. But the Norwegian people knew something the Nazi administrators apparently did not — that The Phantom originated in America. As long as that strip appeared unchanged, the people knew the "news" stories were false. Originally, Falk collaborated with artist Ray Moore. When, during World War II, Moore joined the U.S. Air Force, his place was taken by Wilson McCoy. Later, Bill Lignante, who also illustrated the character's comic book adventures, took over. Starting in 1963, the strip's art was handled by Seymour "Sy" Barry, who stayed with it for over three decades. The strip is currently drawn by George Olesen, who started as Barry's assistant, and Graham Nolan. Falk is still credited as writer, despite the fact that he died in 1999. The Phantom's comic book career has been less steady. He joined the cast of Ace Comics, which already included such King Features properties as Krazy Kat and Blondie, in 1938. He stayed there until the title's demise in 1949. During the 1950s, Harvey Comics published several issues of Harvey Hits reprinting the old Ray Moore strips. In 1962, Gold Key Comics started publishing him on a regular basis. That series was taken over by King Comics in 1966, and by Charlton in 1969. The Charlton series lasted until 1977. DC Comics was the next U.S. comic book publisher to do a Phantom series, with 17 issues appearing between 1988 and 1990. Also, Comics Revue magazine has run reprints of The Phantom's daily strips since the mid-1980s. Like the strip itself, The Phantom's comic books have been more successful overseas than in America. In Europe, artist Romano Felmang has achieved long-running success with the character; and in Australia, Frew Publications has put out an overwhelmingly successful reprint series, which to date has had over 1,000 issues. But he hasn't been entirely absent during recent decades from his country of origin. Since 2003, Moonstone Books has been publishing him in the form of both comic books and graphic novels, in new stories as well as reprints from the newspapers. The Phantom's media history includes a 1940s movie serial, a half-dozen Big Little Books, a 1996 feature film starring Billy Zane, and a series of paperback novels published between 1972 and '75. A descendant of his (the 24th Phantom) appeared in 33 half-hour animated episodes of the syndicated TV show Phantom 2040 (which Marvel published a comic book version of in 1995). Another animated series, Defenders of the Earth, broadcast in 1987 (and also made into a short-lived Marvel comic), deserves special mention, for the highly implausible teaming of the character with Flash Gordon and Mandrake the Magician. The Phantom has never appeared on very many T-shirts and lunch boxes. But as an adventure hero, popular among readers of all ages and in all parts of the world, he has endured while others came and went, and is still going strong. Text ©2000-05 Donald D. Markstein. Art © King Features Syndicate.